We've added seven agent profiles to our database and updated fourteen. That's a lot of motion in the industry, so please make sure you double-check every agent's website or Publisher's Marketplace page before sending your query. .Publishing pay rose an average of 2.8% in 2013. Rolling in money, yeah. A high school student was arrested for writing a story about killing a dinosaur. And similarly, an English teacher is banned from school property because he wrote a novel involving school shootings. In similar news, September 21-27 will be Banned Book Week. In New York? Check out the Floating Library! The 2014 Hugo Awards have been announced -- go check out the winners! The demise of the printed newspaper is a lot closer than we think. Hugh Howey writes about discoverability for writers. Why every story needs an impact character. What happens when multimillion dollar corporations start expecting artists and writers to work for free. I get "offers" at least once a week to write things for some great new start up. "Our website gets 50,000 page views per month!" they'll say, cheerily. "Think of the exposure!" Yes, exposure leads to either sunburn or frostbite, neither of which is pleasant. Don't worry -- musicians get taken advantage of too. Jane Lebak is the author of The Wrong Enemy . She has four kids, three cats, two books in print, and one husband. She lives in the Swamp and tries to do one scary thing every day. You can like her on Facebook, but if you want to make her rich and famous, please contact Roseanne Wells of the Jennifer DeChiara Literary Agency. It doesn’t matter if you’re published and your book is now out for review, or if you’re sending your first book to a beta reader, you have to deal with reader expectations. Most of the time it isn’t an issue. The reader has no expectations, other than they hope your story will entertain or emotionally move them. Other times they have specific expectations that you may or may not meet. The reader might read your blurb and expect ABC to happen in the story instead of XYZ. And because of that, they give it a less than favorable review. There’s nothing you can do about it. You didn’t write the book they would have written, and there’s nothing wrong with that. Be proud of the story you did write. It’s the one that called to you and the one that you needed to bring to life. If the comments are from a beta reader, give the book and comments some distance then look at it through the individual’s eyes. It could be that you decide she was right, and you can edit the book accordingly. Or you might realize she didn’t share your vision for the book and ignore her suggestions. That’s okay, too. It also could be that you wrote a story that went outside the box when it comes to your genre. Some readers will love this. Others will cry foul. Now obviously if you kill off the love interest, you won’t get too far calling the book a romance. There is an expectation from readers of the genre that the story will end with a happily-ever-after. When you kill off the hero, it’s hard to achieve that goal. The solution in this case is easy. Don’t call your story a romance. It isn’t. If you call it women’s fiction (for example), you have a better chance of finding the readers who will better appreciate it. But other than this, like before, be proud of your story. One thing you quickly realize is you can’t please everyone. There’s no point trying. You’ll only drive yourself insane if you do. If you are going to go outside the box, make sure you’re familiar with the expectations of the genre first. It might be you just have to twist the tropes of the genre on the head. For example, in romance, a common trope is where the bad boy meets good girl and he reforms for her–and only for her. Some readers have favorite tropes they love to read and will pick up your book if it contains it. This is great. On the downside, they’ve read the trope so many times, you need to come up with a fresh approach to make your book memorable. There are also readers who hate certain tropes, yet for some strange reason, they still read them, waiting for a chance to tear the story apart in their review. If you’ve done the unexpected with the trope, you’ll surprise the reader and might even possibly delight her. And this could mean a positive review and word of mouth. And then there’s the individual who reads the blurb and misses the obvious clues that your book is horror, and complains in the review that there is horror in the book. Yes, this happens more often than you realize. There’s nothing you can do about that, and that includes leaving a comment on the review about how the person is an idiot. It’s perfectly fine to think that, but it’s not okay to share that opinion with anyone—unless you want it to come back and haunt you. When you write a book, do you write want you want to write, or do you write to meet the readers’ expectations (or a little of both)? We have extended the deadline of the current content…please refer to this post for details! Congratulations to this week’s Successes, Roshani Chokshi and Amber Thielman! Nostalgic for the old days, when authors banged away at their typewriters, key by key? Here's a treat...Fun typewriter app. I'm always looking for tips on improving my author website. Are you? Promoting our work can cost a lot more than we earn. Here are a few excellent (and free) promo tips. Wondering if you should go traditional or indie path? I thought this was a rather well-thought article. A heads up that the QT Entangled category romance contest opens at 8:00 am EDT (Eastern Time) in the morning! It was announced several weeks ago here, and is for category romance only, both adult and YA. Heather Howland, associate publisher and editorial director at Entangled Publishing LLC, has agreed to take a look at the first 100 words of manuscripts and brief (no more than a three-sentence long) pitches for category romance novels. Completed manuscripts are preferred, but partial works will be considered. Please read the descriptions of the imprints in the earlier post and indicate under which imprint you believe your book falls when you fill out the form between 8:00 am EDT on Wednesday, August 13 and midnight EDT on Sunday, August 17. Preference will not be given to any order of submission, so don't worry if you are not entered in the first day. Just get it in when it's convenient. The editor will receive them all at the same time. Entries will not be posted and made public. The form will be sent directly to the judge when the entry window has closed. The contest will open for entries Wednesday, August 13 at 8:00 am Eastern time, and end at 8:00 am Eastern time at midnight, Sunday, August 17. A link to the form will be posted on this blog at 8:00 on Wednesday, August 13. Remember: This contest is for category romance only. Be sure to review the announcement post for descriptions of the imprints. Sometimes you critique someone else's story and gain an important perspective on your own. In my local, real-life, face-to-face critique group, I found myself staring at a short story that just wasn't gelling, and I couldn't figure out why. The whole time I was reading, it felt as if I were handling the story with rubber gloves, and I couldn't feel a thing. Eventually I nailed it: a subtler version of show-don't-tell. The author was showing everything just fine, but we weren't actually in the scene. I'm going to call that "straight narration." I went into the coffee shop, a dilapidated afterthought wedged between the hardware store and the shoe repair shop. I ordered my usual coffee and made small talk until it was time to hand over my ninety-five cents. It hadn't yet begun to rain. The door creaked like a ninety-year-old man's knees as I made my way into the coffee shop. "Hey, Henry." The owner didn't even look up, just started pouring coffee into a paper cup, no sugar, extra cream. I said, "I want a soy hazelnut decaf latte with a shot of strawberry sauce." Henry snorted. "Of course you do." He popped the lid on the cup, and I handed him ninety-five cents, then shoved a buck in the tip jar. "You got an umbrella?" Henry said. "Don't water down my damn coffee." I made my way back up the narrow aisle between the counter and the wall. "It's not going to rain," I said. "Not for a couple hours." It takes up a larger footprint (and please note that I killed a darling in transition,) but once you've got the actual dialogue and the action motions, suddenly the characters begin revealing themselves. The characters start making word choices, decisions about their motions, and they relate to each other. Oh -- now there's something interesting. Because if the POV character had walked in and said, "Give me a black coffee, medium!" then you've got a different character from a POV character who walks in and says, "Um, excuse me, Henry? Would it be okay if I had a coffee with two sugars and one cream please?" The characters choose what to tell the reader and then the characters reveal themselves piecemeal in the details of the way they behave. Think about it: that's how you live your life, piecing together information about everyone you meet from their micro-choices about how to speak, how to act, how to move. The writer is in control in the straight narration -- yes, even though it's first person. The writer has chosen what to tell you and when to say it and inserted her opinion about the surroundings. In scene building, the characters are in control and the writer fades into nothing. Which, arguably, is what we want in the current climate. But overall, a story composed entirely of straight narration will leave readers feeling as if we're handling the text with rubber gloves. It's all right there, and there's nothing wrong with it, but we can't feel a thing. Elizabeth was much too embarrassed to say a word. After a short pause, her companion added, “You are too generous to trifle with me. If your feelings are still what they were last April, tell me so at once. My affections and wishes are unchanged, but one word from you will silence me on this subject forever.” Elizabeth feeling all the more than common awkwardness and anxiety of his situation, now forced herself to speak; and immediately, though not very fluently, gave him to understand, that her sentiments had undergone so material a change, since the period to which he alluded, as to make her receive with gratitude and pleasure, his present assurances. The narrator has been all up in everyone's business for at least 250 pages. Why, then, at this point, does she omit Elizabeth's response to Darcy's proposal? Instead of the actual dialogue, Elizabeth "gave him to understand"that she loves him and accepts his proposal. In this case, I'm convinced it's respect: Austen has shown us these characters at their best and worst and most human, and now she's doing the equivalent of closing the door and letting us imagine Elizabeth's "giving him to understand" in whatever way we want. Moreover, she's giving us a sense of Elizabeth's joyfully incoherence and loss of her capacity for words. Do that. Take your narrative distance and leverage it as one of the many tools in your writing arsenal. Make it work for your story. Get close to your characters. Get further away from your characters. Carry your readers along with you, and your story will love you for it. When I first started writing fiction, I’d never heard of Twitter or Facebook. And blogging, what was that? I had three young kids, but I was able to carve out enough time to write. All my free time went to the novel I was working on. And then I discovered blogging. I didn’t blog much at first, and I only followed a few blogs. That was around the time when Carolyn, Elana, Mary, and Suzie started up the Querytracker Blog. I learned tons from them, and went on to follow a few agent blogs. And over time, I discovered that I needed to become more involved in social media, because if I was ever published, I would be responsible for a lot of my own promotion. Flash forward to today. Now like most writers, my days aren’t just about writing my current WIP (work in progress). I have to spend time playing on my favorite social media sites. I say playing because that’s what it should be. It shouldn’t be work. It shouldn’t be all about promotion. It should be about having fun. Connecting with friends. Making new friends. Making new connections with bloggers who might one day review your book and sign up for your blog tour or release day blitz. Chatting with fans. Fangirling over your latest book boyfriend (that you didn’t write). In a recent Romance Writers of America conference panel I sat on, the participants all agreed that it is the connections we’ve made on the social media sites that helped us the most when it comes to promotion. Whenever we have news to share, our writer friends, book blogger friends, and fans are more than happy to tweet, retweet, and share our news via the various social media sites. Now that’s great, you might be thinking, but I barely have enough time to write my book, never mind hang out on the various social media sites. This is especially true if you have a family, a full-time career, or both. And once you’ve signed a publishing contract, it’s only going to get harder, because now you have to write the next book as well as do developmental, line, and copy edits on the first book. Later, you’ll be proof reading the book while writing your next book and while doing developmental (or line or copy) edits on book two. Oh, and let’s not forget that you also have to write those guest posts for your upcoming blog tour, create picture teasers (if you write a genre in which readers LOVE picture teasers), or writing other types of articles that will help promote your book (whether it be fiction or non-fiction). 1. The best thing to do to prevent your brain from exploding is to create a (flexible) schedule—and try to keep to it. Remember, Twitter doesn’t count toward your daily word count. Nor does commenting on Facebook (as much as we wish it did). 2. 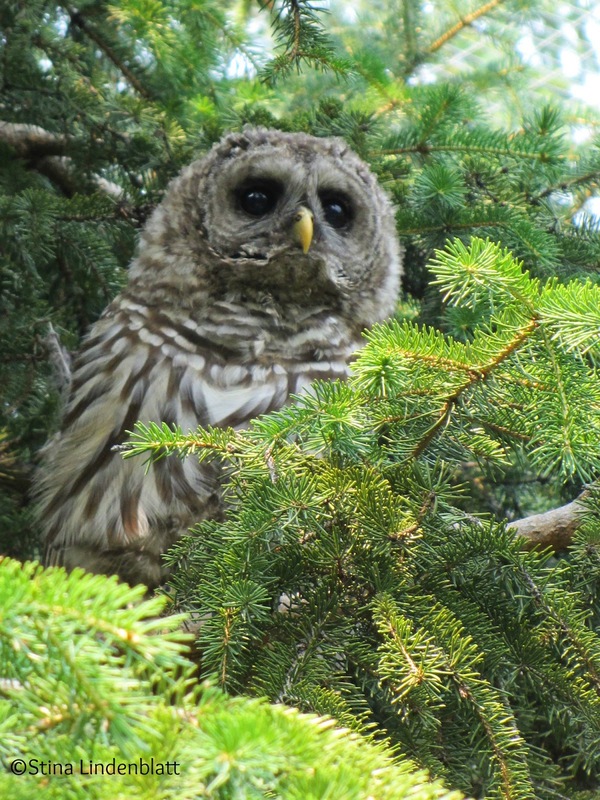 If you have anything promotional you need to tweet throughout the day (for followers who weren’t on Twitter when you first posted it), you can schedule them on a site like Hootsuite. This way whenever you’re on Twitter, you can stick to having fun stuff and save time. 3. Turn off the Internet if you have a habit of getting distracted and usually end up spending more time on it than you should. 4. Set a timer, or else your quick five minutes on Twitter could end up being thirty. 5. Assign specific days for certain social media sites. Maybe you love Twitter and aren’t a huge fan of Facebook, but understand the value of your page. You could tweet daily, but post Monday and Wednesday on your Facebook page (as well as visit the pages you follow and comment on those posts). 6. That will make things more manageable than forcing yourself to do both every day. 7. With your writing, set up a schedule and stick to it. Determine what the bigger priority is and focus your time on that (without neglecting the other tasks). Hint, the project with the deadline is the biggest priority. If you have two deadlines plus you have to write blog posts for your upcoming blog tour, then divide your day into manageable chunks and assign each task to be worked on then (e.g. edit in the morning and write blog posts in the evening). It’s not always easy to balance it all, but it’s the reality of our job. And make sure you reward yourself each day for accomplishing what you set out to do. Do you have any additional tips for balancing the responsibilities of our writing careers? Do you find it easy to do or do you, like most writers, struggle with it? 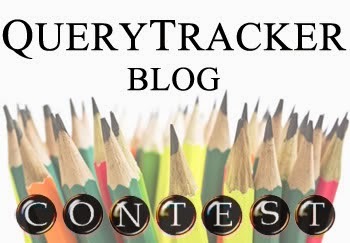 QueryTracker is happy to announce a new feature here on the blog. We would like to invite readers to present us with agent and query-related questions and we’ll do our best to find the answers for you. So, if you have any questions, please post them in the comments below. The first question I’d like to address is from an anonymous QueryTracker member. What does it mean when I receive an extremely quick rejection to a query? That’s a good question, and you can actually learn a lot from the time it takes the agent to respond. But before I go into that, I’d like to begin by explaining what a quick response does NOT mean. I’ve heard authors complain that, because they received a rejection in just a few hours or even minutes, that there was no way the agent even read the query. Not true. Think about it. If the agent wanted to blow off queries, why would he respond at all? He wouldn’t. He would just delete the email and move on. What that quick response is telling you is that your query was so wrong that the agent barely had to think about it. It was an easy rejection. And when I say wrong, I don’t mean there is something inherently wrong with your query. It could be something as simple as your project is not for a genre the agent represents. If that’s the case, why would the agent bother to read any further than the genre declaration? He’ll simply reject it and move on. There are other things that can be grounds for an instant rejection besides genre. Extremely long or short manuscripts could cause instant rejections, as well as not stating your word count or genre in the query. So, if you’re getting a lot of quick rejections, take a close look at your query and the agents. Are you sure they represent your genre? Is your word count within the norms for that genre? If the above points seem to be okay, then you’ll have to dig a little deeper. Is your query letter too long? It should be about a single page. If it gets a lot longer than that, you could be inviting an instant rejection. Or is it too short? If your query doesn’t cover all the key points, the agent probably won’t take the time to ask for more information. I’m not going to cover the ins and outs of writing a query letter. This is supposed to be a short post after all. But make sure your query looks professional. Odd fonts and text colors can also be grounds for instant rejection. You can learn more about query writing from past blog posts here and here. Other things that may cause an instant rejection are addressing the query to the wrong agent, including attachments, or not following the agent’s explicit query submission rules. Does an instant rejection always mean a problem with your query? Nope. Nothing in this business is that cut and dry. But if you seem to be receiving a lot of instant rejections, then you should take a close look at your query. QueryTracker offers many tools to help you diagnose problems. Take a look at the “Query Response Time” reports for an agent and see if she tends to reply quickly or not. If she normally takes 30 days to respond to a query and you got your reply in 3 minutes, then your query may have one of the problems mentioned above. You can also look at the “Genre Reports” to see if the agent typically rejects projects of your genre. If she does, then that may be the issue with your query as well. You may also want to limit the report range to the last 90 days or less, since agent’s preferences can change over time. Learn more about viewing QueryTracker Reports. This week we've added three agent profiles to our database and updated two. Please make sure you double-check every agent's website or Publisher's Marketplace page before sending your query. Harlequin's sales numbers are down, and within days they'll be sold to HarperCollins. Alloy Entertainment launches a digital first imprint with Amazon. Apple has purchased Booklamp, reputed to be a Pandora for books. Please remember our Category Romance contest! First hundred words, a pitch, and winners get a full request from Entangled Publishing. Check out the details and then enter! Agent Jessica Watterson talks about the query process. 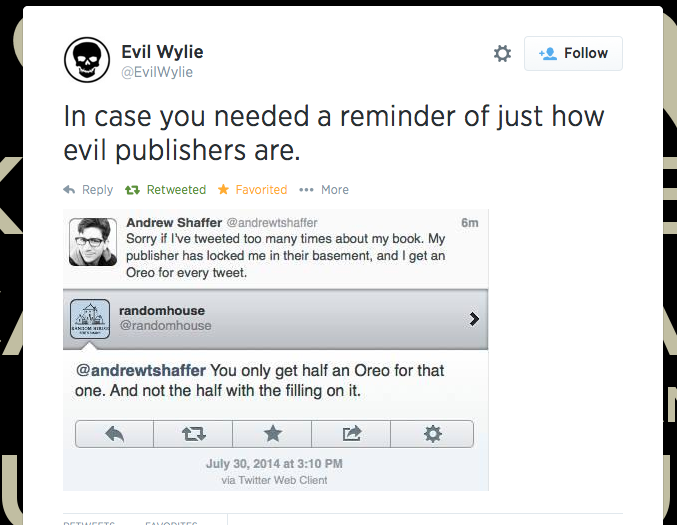 Passive Voice Guy discusses the persistent stigma of self-publishing. From the same blog, deciphering the inner workings of the Author Earnings Report. The five best questions to ask if interviewing a writer. On book publishing and socialism.